Let’s face it. Alabama is not exactly hot vampire territory. New Orleans? Sure. Savannah? Charleston? Somewhere down on the bayou? Maybe. In the South, after all, things can “go south” fast. When I began looking for a place to plant my happy little community of vampires and their human familiars in Redemption and the Penton Legacy series, I discovered that I needed to look no farther than a little crossroads about thirty miles from my backyard. So I began scouring around for a place that was rural. Off the beaten path. A place where few humans or vampires would have reason to travel. Chambers County, Alabama, only twenty or thirty miles from my home, turned out to be perfect. The county seat of LaFayette (accent on the FAY) is a beautiful, classic small Southern town. But the whole county was hit hard when the textile industry moved overseas, factories closed, businesses failed. Picturesque old buildings stand empty. A lot of people have moved on. Available real estate is plentiful and inexpensive. And it’s isolated. It’s thirty or forty miles to the nearest hospital. The ideal spot, in other words, for a handsome, enterprising Irish vampire like Aidan Murphy to start buying up properties until he owned the entire town and could repopulate it with his own vampires and bonded humans. They could all live together in peace and harmony. Only, of course, that doesn’t happen (otherwise there would be no book!). When the town’s human doctor—the familiar of one of Aidan’s vampire lieutenants—is brutally murdered and a Gaelic symbol for “brother” carved into his body, it sets off a chain of events that pits brother against brother and vampire against vampire, with one very human woman caught in the middle. And to think a couple of weeks earlier, she didn’t know vampires existed. It’s the beginning of a vampire war…in Alabama. By the way, the title of this post is a paraphrase of a line from the film version of Gone with the Wind. Does anyone remember the original line and who delivered it? Answer correctly for a signed bookplate! I’ll check in with the correct answer later in the day! Following a worldwide pandemic whose vaccine left human blood deadly to vampires, the vampire community is on the verge of starvation and panic. Some have fanned into rural areas, where the vaccine was less prevalent, and are taking unsuspecting humans as blood slaves. Others are simply starving, which for a vampire is worse than death—a raging hunger in a creature too weak to feed. Immune to these struggles—at first—is Penton, a tiny community in rural Chambers County, Alabama, an abandoned cotton mill town that has been repopulated by charismatic vampire Aidan Murphy, his scathe of 50 vampires, and their willingly bonded humans. Aidan has recruited his people carefully, believing in a peaceful community where the humans are respected and the vampires retain a bit of their humanity. But an unresolved family feud and the paranoia of the Vampire Tribunal descend on Penton in the form of Aidan’s brother, Owen Murphy. 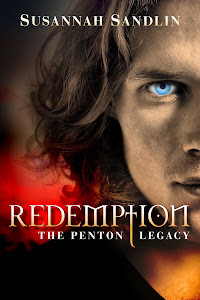 Owen has been issued a death warrant that can only be commuted if he destroys Penton—and Aidan, against whom he’s held a grudge since both were turned vampire in 17th-century Ireland. Owen begins a systematic attack on the town, first killing its doctor, then attacking one of Aidan’s own human familiars. To protect his people, Aidan is forced to go against his principles and kidnap an unvaccinated human doctor—and finds himself falling in love for the first time since the death of his wife in Ireland centuries ago. Dr. Krystal Harris, forced into a world she never knew existed, must face up to her own abusive past to learn if the feelings she’s developing for her kidnapper are real—or just a warped, supernatural kind of Stockholm Syndrome in which she’s allowing herself to become a victim yet again. Susannah Sandlin is the author of paranormal romance set in the Deep South, where there are always things that go bump in the night! A journalist by day, Susannah grew up in Alabama reading the gothic novels of Susan Howatch, and always fancied herself living in Cornwall (although she’s never actually been there). Details, details. She also is a fan of Stephen King. The combination of Howatch and King probably explains a lot. Currently a resident of Auburn, Alabama, Susannah has also lived in Illinois, Texas, California, and Louisiana. 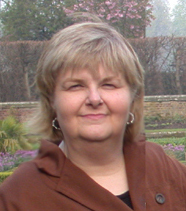 Her novel Redemption won the paranormal romance category in the 2011 Chicago North RWA Fire and Ice contest, and is the first of three in a series that debuts this year. Win a signed bookplate by Susannah by answering her question (in orange above) in a comment! Commenters from the tour will win a $50 USD Amazon gift card, 6 Redemption Prize Packs with a signed book and swag! Giveaway is open worldwide and ends on 31 July 2012!